A Year Ago, the Sun Disappeared. This Year, a NASA Probe Travels to 'Touch' It. 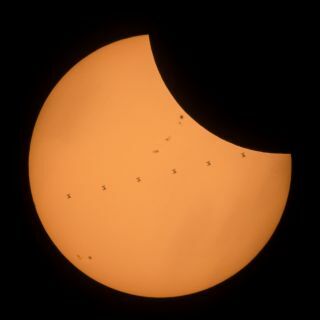 The International Space Station was spotted crossing in front of the sun during the August 2017 total solar eclipse. A year ago, scientists and amateurs across the country scrambled to gather precious data about the sun during the Great American Solar Eclipse — and today, many of the same sun-lovers are eagerly following the progress of NASA's first spacecraft to "touch" the star that shapes our lives. Three total solar eclipses will grace Earth during that spacecraft's seven-year mission studying the sun. Those events will reveal the otherwise-invisible solar atmosphere known as the corona— precisely the part of the sun that the mission is focusing on. The data the Parker Solar Probe gathers will be unlike any scientists have ever been able to access. "It's literally like flying through and putting your hand outside the spacecraft and collecting observations directly as opposed to being 93 million miles [150 million kilometers] away and having really amazing telescopes that give us a unique perspective," Alex Young, a solar scientist at NASA, told Space.com. "You've got to be there up close and personal and measuring these things directly. Otherwise, you don't have a complete picture." That's not to say eclipse data hasn't been valuable, of course. For more than a century, scientists have chased eclipses wherever celestial geometry has led them, desperate for a glimpse of the fickle corona. That feature was only ever identified because of eclipse observations. Without the moon blocking out most of the sun's brightness, the corona is impossible to see at all, much less in any detail. "One of the things that we gain from a total solar eclipse is we see the detailed structure [of the corona]," Young said. "Having this global viewpoint of the basic structure of the sun's atmosphere and then having the detailed observations of Parker Solar Probe really allows us to fill in the pieces of the puzzle. This really is a grand puzzle." The first two eclipses during the mission will be visible across parts of South America in 2019 and 2020. But the third eclipse of the mission, in 2024, will be the sequel to the 2017 Great American Solar Eclipse, crossing a swath of the U.S. stretching from Texas to Maine. That year will also see the sun around its maximum activity level and the Parker Solar Probe's closest approach to the star. The probe will fly to within 4 million miles (6.4 million km) of what we consider the sun's surface. "2024 will be a pretty exciting time. There'll be a lot of things happening on the sun," Young said. As to what the Parker Solar Probe might measure, there's no way to know in advance precisely what will be happening on the sun at the time. But during the 2024 eclipse, the spacecraft will be at the right altitude above the sun to fly through what scientists call a streamer belt, a peak of coronal material flowing out of the sun. "Parker Solar Probe will be up close and in the corona and able to provide in situ data while we're seeing those total eclipses," project scientist Nicola Fox, a solar scientist at Johns Hopkins University, told Space.com. "The ideal thing is that we're actually flying through one of those streamer belts while the Earth is treated to a total solar eclipse." But regardless of the mission's luck catching the phenomenon, even once the Parker Solar Probe has completed its groundbreaking mission, eclipse observations will never become obsolete, Young said. "Those will still be critical observations despite the most sophisticated, expensive equipment that we have in space," he said. "We always need multiple viewpoints, and we are still in a situation where there are certain observations, especially during eclipses, that we can only take from the Earth or from aircraft."